I have been so busy - and away too - over the last few months. No apologies really, but I am sad about so much that I have not blogged including my textile tour of Egypt and Syria. 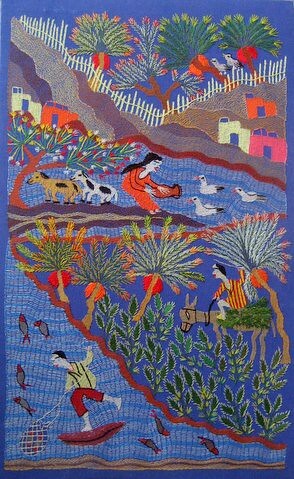 Now another textile related subject - the enchanting embroideries of Akmeem. Women are beingtaught some basic stitching and let go with threads and fabric to stitch what they see in these areas to make a little extra money for the household. The work is beautiful, bright and colourful, and full of fascinating glimpses into life in Upper Egypt (which always confuses me as it is south!). I love the obvious observation of the way people appear when swimming in this one - bits and pieces just appear above the water. My favourite - and the smallest. oh they are wonderful. Really lovely. I think The Lake is my favourite, but the tree in the first piece is gorgeous too. I love these embroidered portraits - an acquaintance of mine has several. I would love to get a few for myself. Is there any place in Cairo to buy them? 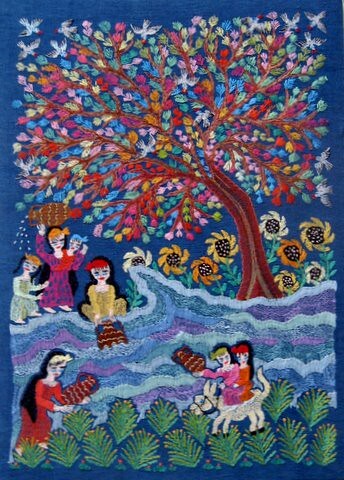 I so love these embroideries. I have four but would love many more. The colors, the joy... Love that Summer Holidays. Hope we still get to hear about your textile tour of Egypt and Syria. These are beautiful Jenny. You certainly are finding some gems.They are so happy they make you smile. Thanks so much for the contact information, Jenny. I went this afternoon - my wallet is now considerably lighter! oooh these are gorgeous. i especially love the little hourse in the summer holidays. thanks for sharing! Beautiful embroideries! I am so enjoying your blog and hope you don't mind that I have added your link to my blog roll. 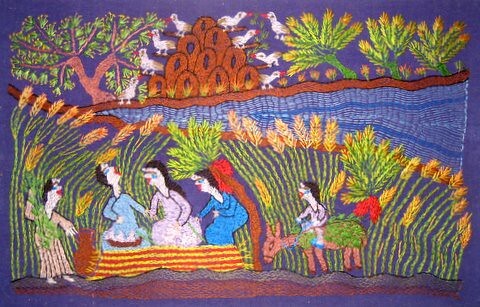 How beautifull these embroideries! Especially that from the lake Naanaa Adib. It is always a pleasure to read your blog, you do have a gift to find beautifull textiles. I hope you do not mind that I added your link to my web-log. Thanks for sharing! I hope the sadness is comforted. The stitcheries are truly splendid - such colour. I am visiting cairo within the next couple of months -- where can I purchase items like these? They are stunning. I live in Canada and they remind me of embroidery of the inuit. 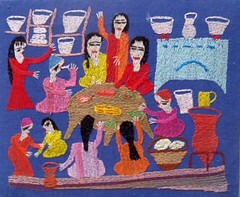 Please let me know where I can see some more of these embroideries, also to purchase. What beautiful pieces of embroideries. I live in Florida but grew up in Alexandria. I preciously keep the art pieces I have from Egypt. Now I write romance novels set in various part of the world. My first book TO LOVE A HERO was set in Belarus. Thank you Jenny for posting these pictures. I do love these...I bought a couple at the CAC CHristmas Bazarre years ago. They despict the foul vendor on the street, children playing, etc. 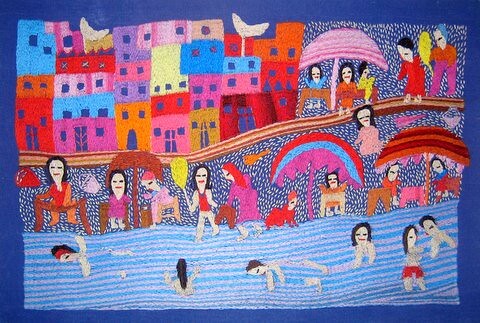 What fun embroideries! I'd love to have you come on as a guest author for Fiber Focus. We haven't had anyone write about Egyptian textiles yet and you would fit right in! I'm adding you on as a link. All the best to you!